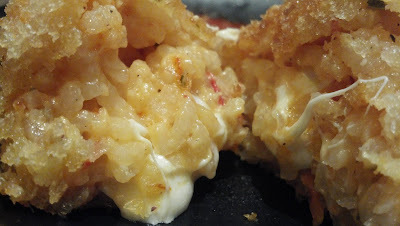 Arancini - an Italian staple that I'd never even eaten before, never mind made. I felt it was my Italian duty to at least see what all the fuss is about and I'm seriously glad I did. What could be better than little deep fried balls of risotto stuffed with melted cheese? They come out crispy on the outside and gooey on the inside and taste like nothing I've ever had before. They're truly something special. The first thing you need is a risotto. 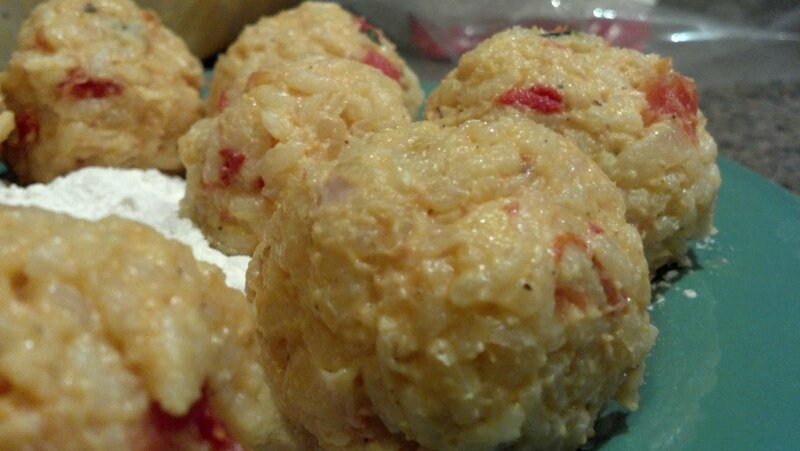 Most recipes call for leftover risotto so it has time to chill which makes it easier to form into balls, but I didn't have any leftover so I had to make some. I made up something similar to this except I didn't add the corn and I added a little red pepper and tomato sauce along with the chopped tomatoes. I was in a rush so I had to throw that in the freezer, stirring every half hour to get it chilled out. 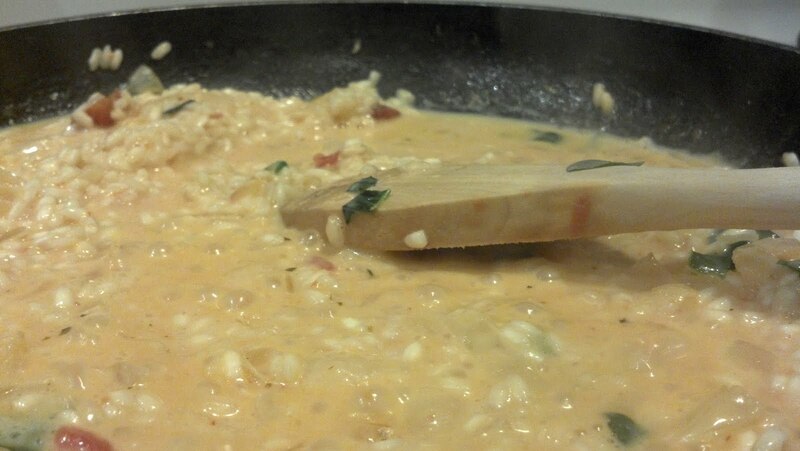 The risotto is really the hardest part. Once the risotto is cold, you have to prepare the balls for breading and frying. I formed 2-3 inch balls and stuffed a fat chunk of smoked mozzarella in the middle of each. The smoked mozz was key and added a ton of flavor in the final product. Once the balls are formed, I dredged in flour, egg, and panko (a type of breadcrumb) and deep fried in veg oil until golden brown. One key thing is to serve them immediately to ensure the cheese is still gooey in the center. Serve with your favorite marinara - I didn't have time to make one so I bought one that ended up being terrible so I had to throw together a quick garlic tomato cream sauce instead. 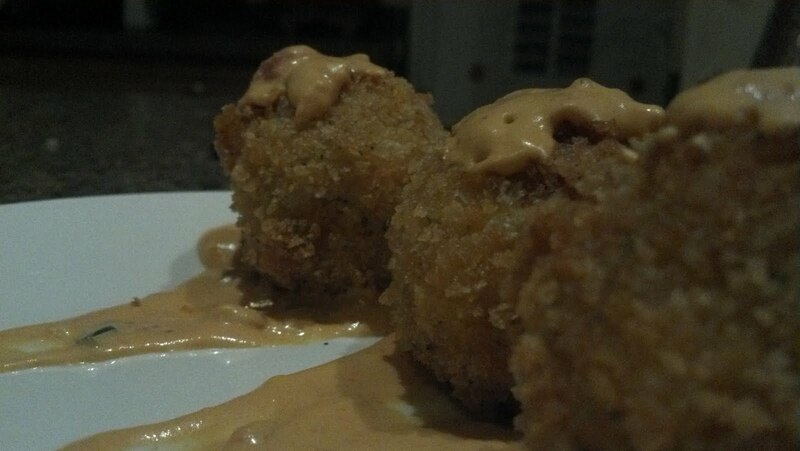 If you can, use a good marinara, the cream sauce was too heavy for the arancini. Katie put together a light arugula/asiago/tomato salad and we had a nice little Wednesday night dinner. And then got to watch the Red Sox miss the playoffs - Let's Go Yankees!